People often email us with specific questions; sometimes the answers might be helpful to other folks, too. This gentleman has seen our video series with Living Web Farms, and asked about the multi-wire reel we exhibited at that event. Hi, Carl! We’re glad the video is useful. 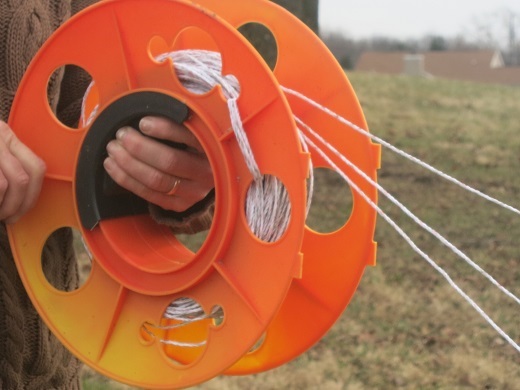 The multi-wire reel (that one actually has three wires) is a DIY dodge authored by Tony McQuail, an Ontario farmer and author, who uses it to pasture his draft horses. It’s a plain plastic extension cord reel, like what you would buy at the home improvement store. He loads it with three strands of turbo-wire (heavy-duty braided twine), and ties the three strands off to a single step-in post that stays with the reel. We only put a maximum of about two hundred feet of twine (each strand) on a single reel, because, as you guessed, if you get them tangled you’re going to have a mess. We use it the same way he does, as a cross-fence across a fenced pasture; that is, from one side to the other of a pasture with a permanent electric perimeter fence. 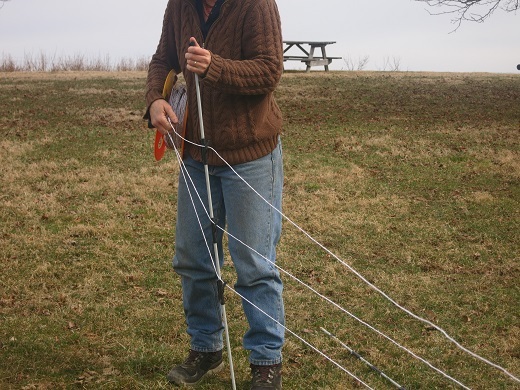 On one side of the pasture we set the single tied-in step-in post, attaching it to the perimeter fence with a short contact wire (about 18 inches of insulated wire with aligator clips on each end). 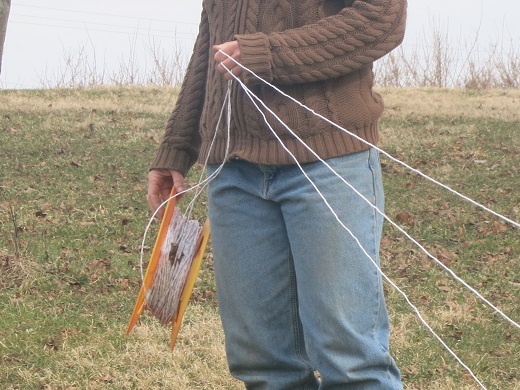 Then, carrying the reel, and with the three strands of twine separated by our fingers so they’ll run out without tangling, we step out the fence, setting additional posts every ten steps or so, until we reach the opposite side of the pasture/opposite fence, and set a last post. 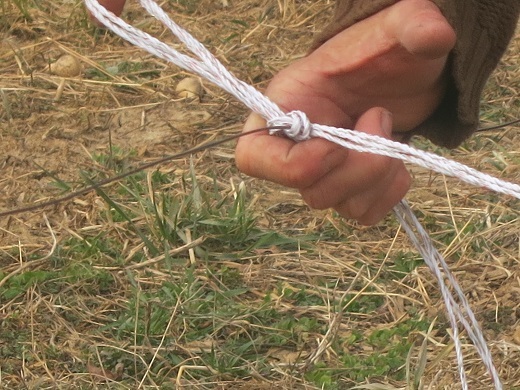 Then to keep the tension even on the three strands of polytwine, we pull another three feet or so of twine off the reel and tie it in a hank around one of the perimeter fence wires. Those plastic reels are light enough that they hang pretty easily from a fence post; or, if the weather is dry, I think Tony just puts it on the ground. I wish I could draw it; I know verbal instruction can be confusing! Picture it this way: say you cut three strands of braid, all the same length, and tie them in to an extension cord reel. Then wind them all onto the reel — they won’t load at exactly the same rate, so by the time you reach the ends they’ll be a little uneven, but not too much — and then tie off the ends at graduated heights on a step-in-post. This is the basic apparatus. Shove a contact wire in your pocket, and half-a-dozen extra posts under your arm, and you’re ready to start. Say you’ve got a pasture with decent perimeter fences that will contain whatever species you’re planning to graze — if sheep, say your perimeter is five strands of high-tensile, or maybe some hog wire — and all you need is a way to break that pasture up into smaller pieces, you can cut out one end with a three-wire reel and graze that on day one. The next day, take a second three-wire reel and cut out another section next to the first, pull back the first cross-fence at one end and let the animals through, move their water up, and let them graze this second section. Day three, take down the first (original) cross-fence and jump it over the second one and let them through again, and so on down the line. I dont’ know where you are, but we’ll be doing a full-day workshop on farming, with about half the day devoted to fence, the second weekend in April, here at our home farm, if you are interested. We’ll also be doing a half-day grazing workshop in Asheville at the Mother Earth News Fair at the end of April, and a full-day workshop in Front Royal, VA, in October. It’s a lot easier to demonstrate fence than to make it clear in words!